This post perhaps takes the blog on a slight tangent, but what the heck. It involves beer. 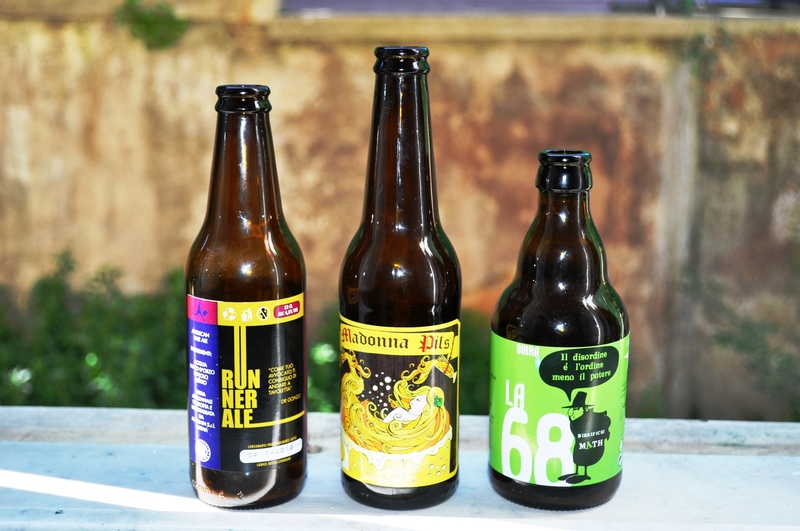 And the project was an excuse to buy a selection of beers from a new shop on Viale Quattro Venti in Rome (number 265; it’s a branch of the small chain Gradi Plato). It’s one of a crop of shops that’s been springing up in the time we’ve lived in Rome that specialise in selling international and craft beers. This guy had a global selection, so I asked him for something Italian, and light and golden, as I wanted to use it to make batter… and drink. We discussed various things, and although he didn’t really seem to understand the term “golden ale” (though I have seen it on other beer menus here), we bought a pils (that is a Pilsner lager), an APA and a wheat beer. Now if only I could remember the name and address of the shop. I can’t. But it’s here on streetview, the righthand closed shutter. Anyway. As strangers in a strange land, we occasionally crave the foods of home. 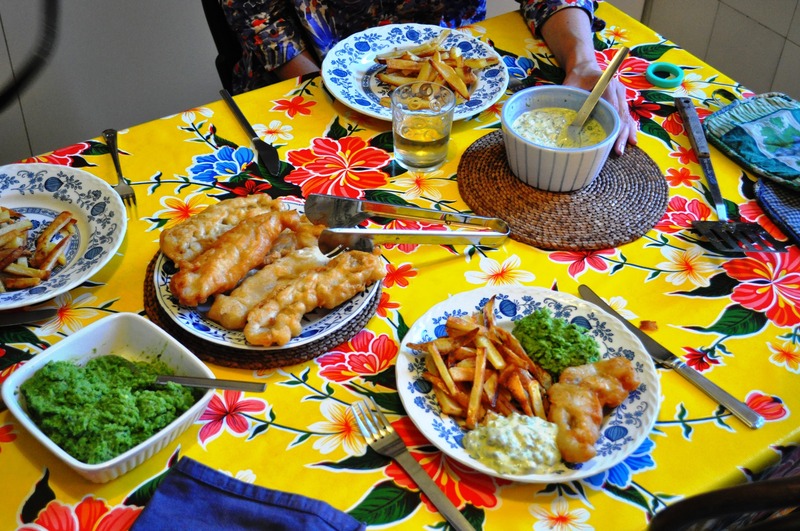 In this case, we’re Brits, and I’ve been craving fish and chips. You could say that the Roman filetto di baccalà when served with patatine fritte is basically the same thing, but… well, no. Just no. 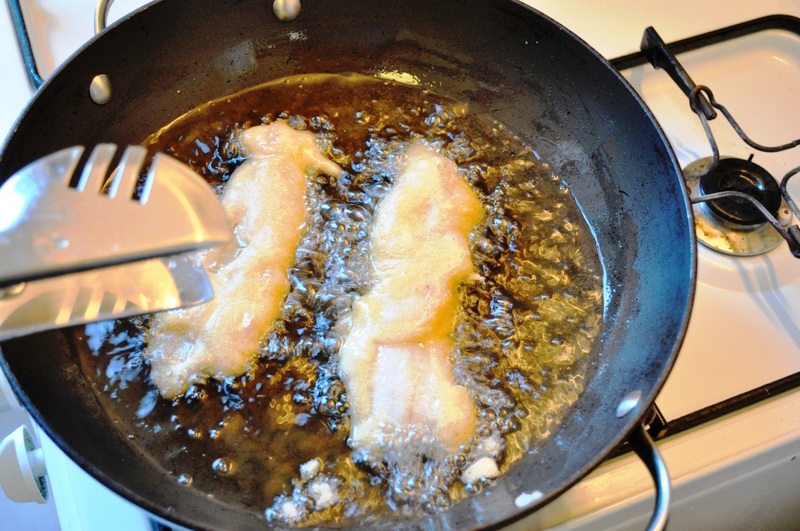 Filetto di baccalà is made with salt cod, and while it is battered, it can be made too far in advance meaning the batter can be flaccid, the fish mushy. Plus, I just need my condiments and sauces. It always bemuses us that while Romans have such a passion for deep-fried goodies – fritti – they tend to eat them dry and unaccompanied. A plate of fritti like suppli (rice balls with mozz in the centre, coated in breadcrumbs and deep-fried), fiori di zucca (zucchini/courgette flowers stuffed with mozz and anchovy, deep-fried in batter), and various fried animal bits like animelle (sweetbreads) really ought to be eaten with a nice tangy sauce, something involving tomatoes and peppers, like a tangy chili jam. Even ketchup would be nice. But no. 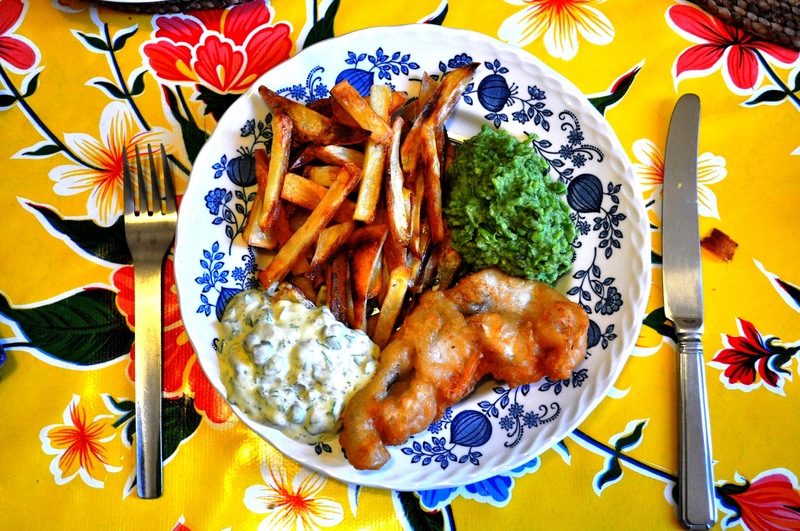 This craving for fish and chips means I’ve been experimenting with making it at home. I’d only tried this a few times when we lived in the UK as, frankly, why bother in a land of chippies and gastropubs selling fish and chips? I read around for good recipes and then broadly went with Felicity Cloake’s advice from her “How to cook the perfect…” column in the Guardian. Though her recipe makes too much batter for my needs. And I forgot to chill the flour. Apparently having all the ingredients as cold as possible makes for a lighter batter, but mine sufficed just with cold beer. Of the three beers I bought, I used the pils, reasoning that it was more effervescent, and would help keep the batter light. Plus, I don’t actually much like pils to drink so was more keen on drinking the other two. I used a Madonna Pils from Free Lions in Tuscania, near Viterbo, Lazio, a brewery founded by Andreas Fralleoni after a career in the banking industry. Leaving behind the evils of banking to make craft beers? Well done that man. (They only have a holding page online at the moment, but it features their funny little logo.) So while I found this pils a bit acrid and hoppy to drink, it made an excellent batter ingredient. This makes enough for about 4 medium sized fillets. 1 Preheat the cooking oil. I used sunflower oil. The fat you fry in is a whole other argument. A true fish and chip aficionado would say it has to be beef fat/dripping, but, well, sod that. Sunflower oil is fine and doesn’t conflict with the flavour of fish. 2 Sieve together the flour and baking powder and add the salt. 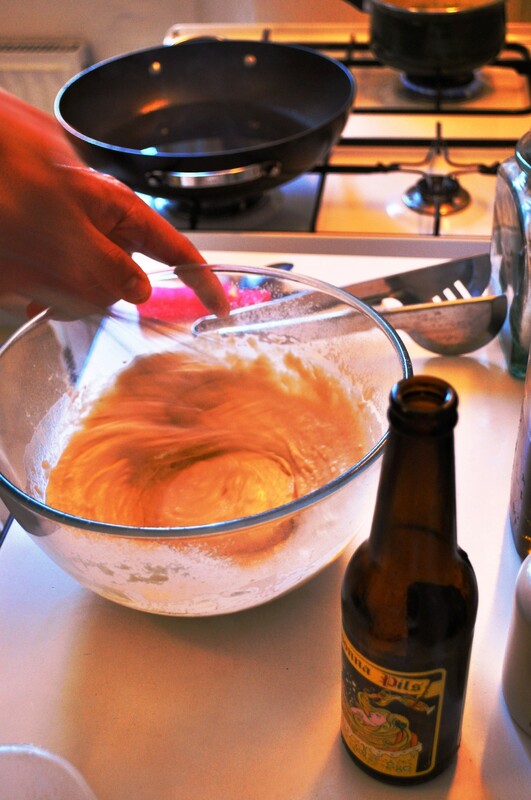 3 Whisk in the beer to achieve a thick, creamy consistency. 4 Batter the fish and deep-fry straight away. The last time we experimented with this, Fran was in charge of buying the fish. As the names of the fish on our local market stall remain such a challenge (she clearly didn’t refer to my handy list of fish names in Italian, English and Latin), when she explained what she wanted the fillets for they persuaded her to buy palombo. Which was unfortunate as this may well be small, potentially endangered species of hound shark. This time round, I was in charge. Buying “sustainable” fish is always a tricky proposition, and frankly something that’s subject to a lot of greenwash and disinformation. My loose rule of thumb is to avoid tuna species, avoid monkfish species, avoid cod, and generally stick with things like anchovies and mackerel, ideally caught by small, local fishing boats. In this case, I ended up buying some fish the vendors referred to as “local”: musdea, aka mostella, which I believe is a type of forkbeard, a relative of cod, Phycis phycis or Phycis blennioides. Although neither are on the IUCN red list (they’ve not be assessed yet), the latter species is listed as one to avoid on the UK’s Marine Conservation Society site. Hopefully it’s not been so overfished in the Med, but I know that’s a vain hope. The only consolation is that we don’t do this too often. Sustainability is of course about making the right choices, but for a society like ours, predicated on over-consumption, realistically it’s also about doing the wrong things less frequently. Anyway. After I’d fought the fillets to remove the bones, this forkbeard fried up really well. I don’t have an oil thermometer (though I would like one of those fancy IR guns, available from a corporate tax-dodger not very near you), so I just played it by ear. I did three batches, with the second two pretty much perfect. Apparently you want 185C or thereabouts for deep-frying fish in batter. 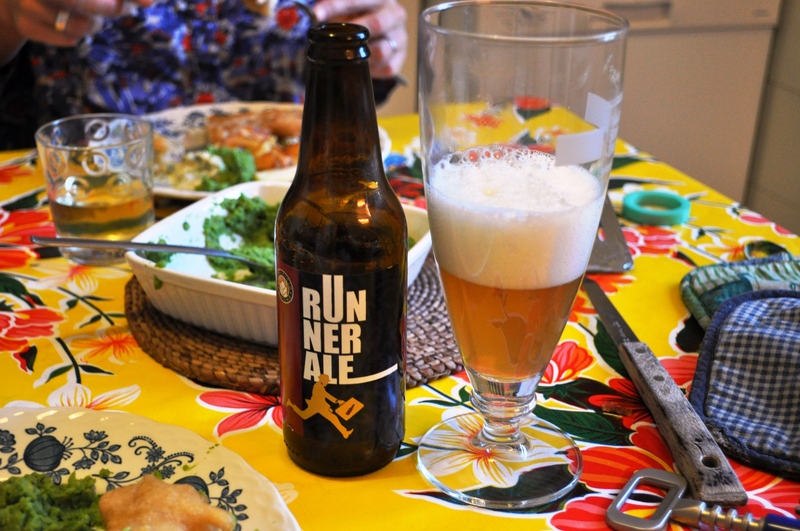 It went down very well with the other beers I’d purchased: La 68 from Math brewery in Florence, Tuscany, and Runner Ale from Pontino brewery, which seems to be part of All Grain SRL in Latina, southern Lazio. Math don’t have a proper site up yet, and I don’t know anything about them, but I love their style already. 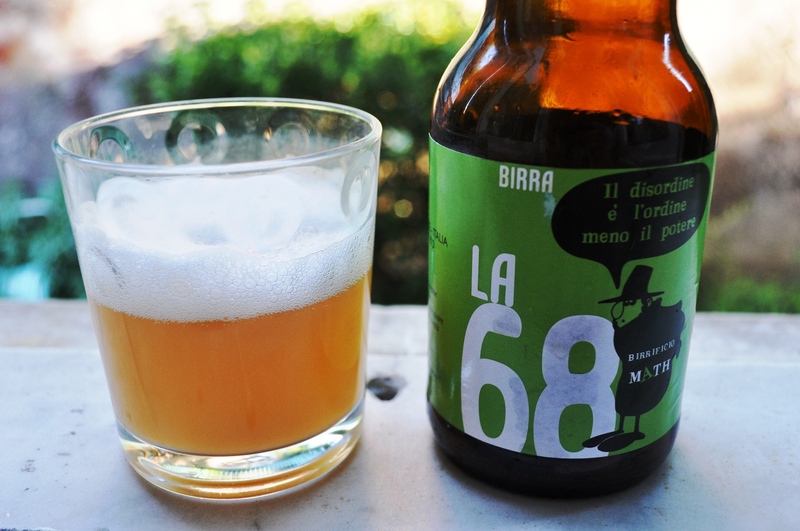 The design is cool and La 68’s label includes a funny little fellow with a speech bubble with this beguiling epigram: Il disordine é l’ordine meno il potere, “Disorder is order without the power/means/ability” The beer itself was a fresh summer beverage: a 5% wheat beer whose ingredients also include spezie, “spices”. I’m not sure which, but it had a nice limey flavour and subtle hoppiness. As you can see, I went the whole hog here and did chips, tartar sauce and mushy peas. I’ll admit the chips were not proper chips. As I don’t have a proper deep-fat fryer or even a pan with a frying basket, I couldn’t be bothered. I’d read up Cloake and discussed proper chips with friends (the knowledgeable Oli Monday saying they were best when “oil-blanched”, frozen, then deep-fried a second time) for my last experiment, but this time I just cut chip shapes and roasted them, without any pre-cooking, with plenty of sunflower oil and salt. They tasted good even if they weren’t proper chips. As for the tartar sauce. I just had to. As I said above, fried food needs condiments. One of things that drives me made about British pubs is getting tartar sauce in those tiny sachets. I need about 10 per meal. So here I made a decent bowlful for the three of us. 1 Put the yolk in a bowl and whisk it a little with the Dijon. 2 Start adding the oil, whisking constantly, starting with just a few drops. 3 When the oil and yolk starts to emulsify, you can pour in the oil, whisking continuously. 4 When the mayo starts to thicken, thin it down with lemon juice and water, to taste. 5 Add the cornichons, capers, parsley and taste – your capers could be quite salty still, so you might not need to add more salt. 6 Add more lemon juice to taste. Years ago, there was a great ad campaign in Britain that called some industrial brand of mushy peas “Yorkshire caviar”. Funny, if not entirely true. The industrial stuff, made with dried marrowfat peas (that is, big old starchy peas, Pisum sativum) rehydrated and dyed green, can be pretty nasty. Homemade mushy peas, however, are delicious. 2 Place the peas in a pan with a good knob of butter, say 30g. 3 Add a handful of fresh mint, roughly chopped. 4 Add enough water to cover then bring to the boil and simmer for about 10 minutes, until the peas are tender. 5 Drain (keeping the cooking water) then puree with a zizzer (er, hand-blender), food processor, or just mash with a work to the desired consistency, adding more of the cooking water as necessary. 6 Add a bit more butter if you fancy it and season to taste with salt. You could add black pepper, but frankly with something so lovely and pea-y and minty, I don’t think it’s needed. Serve it all together, warm and lovely. With good quality craft beers – chosen according to your taste and the season, naturally. Thanks. The first photo was a bit weird, looks a bit dark and burnt, but it was the best I got before we, you know, ate everything! Thanks for the link to Google street view; I know exactly where it is, and will be walking down there this evening wearing an empty rucksack and a dog. On mint: try putting it in at the end of the cooking period. I think you get FAR more flavour that way. And finally, consider opening a pop-up for ex-pats. Yes, I generally use mint and (fine) herbs at the end. That was especially drummed into us at the Academy, where we wouldn’t cut the (fine) herbs until the last second, to keep the essential oils in the dish. In this case though, I read a few recipes online and kind of reasoned it was good to get everything mushed into together, and I wanted more pea than mint in the flavour. That said, if I did it again, I would consider chopping another handful to add at the end. Have a good jaunt to the beer shop. It’s only a small place, but he has a reasonable selection. There’s another similar place (or there was about 12 months ago) on Via Fonteiana too. And have you noticed the one that’s popped up by Fata Morgana in Piazza San Cosimato? As for a pop-up for ex-pats. Yes, we’ve mused about that before. A food wagon selling quality British fare. Scones (would have to import or make clotted cream), pasties, some *proper* imported cheddar (for sarnies), etc etc. Not sure I could cope with hours of deep-frying though! Well this was all so blooming good I just had to make it. Well the fish at least. Excellent batter (thanks dan and Felicity) that I will be making again. I used a rather odd pils called Silly that I won’t be buying again but worked pretty well. I will be trying something form our oais next time. I might even go the whole hog and make the peas and sauce too. Glad it worked Rachel. Defo worth making the sides and condiments too though. I don’t know that pils. You could probably use any beer really, but certainly somthing with a bit more fizz is better.